Alan Joseph Balmer, Trivedi Global Inc.
Dimitrius Anagnos, Trivedi Global Inc.
Joni Marie Holling, Trivedi Global Inc.
Joy Angevin Balmer, Trivedi Global Inc.
Vaibhav Rajan Parulkar, Trivedi Global Inc.
Zinc chloride is an important pharmaceutical/nutraceutical mineral for the prevention and treatment of several diseases. The objective of the current study was to investigate the impact of The Trivedi Effect®-Energy of Consciousness Healing Treatment (Biofield Energy Treatment) on physical, structural, thermal, and behavioral properties of zinc chloride using PXRD, PSD, FT-IR, UV-vis, and DSC analysis. Zinc chloride was divided into two parts – one part was control, while another part was treated with The Trivedi Effect® remotely by seven renowned Biofield Energy Healers and defined as The Trivedi Effect® treated sample. A significant alteration of the crystallite size and relative intensities of the PXRD peaks were observed in The Trivedi Effect® treated sample with respect to the control sample. A sharp peak at 2θ equal to 51.45°, which was observed in the control sample was disappeared in the treated sample. The average crystallite size of the treated sample was decreased by 2.13% compared with the control sample. The size of the particles at d10, d50, and d90 was decreased by 3.36%, 7.97%, and 11.51%, respectively in the treated sample compared with the control sample. The surface area of the treated sample was significantly increased by 5.69% compared with the control sample. The FT-IR spectroscopic analysis revealed that Zn-Cl stretching in the control was 646 cm-1, whereas it was significantly shifted downward to 505 cm-1in the treated sample. The UV-vis analysis exhibited that wavelength of the maximum absorbance (λmax) of both the control and treated samples was at 196.4 nm. The DSC analysis exhibited that the melting and decomposition temperature were increased by 0.93% and 0.56%, respectively in the treated zinc chloride compared to the control sample. The enthalpy of fusion of the treated sample (338.27 J/g) was increased significantly by 33.84% compared with the control sample (252.75 J/g). The enthalpy of decomposition of the treated sample was increased by 3.78% compared with the control sample. 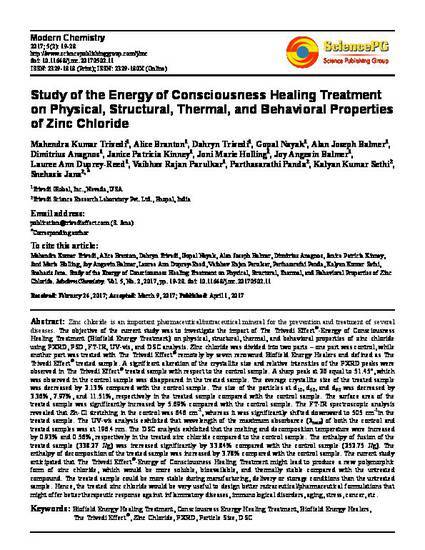 The current study anticipated that The Trivedi Effect®-Energy of Consciousness Healing Treatment might lead to produce a new polymorphic form of zinc chloride, which would be more soluble, bioavailable, and thermally stable compared with the untreated compound. The treated sample could be more stable during manufacturing, delivery or storage conditions than the untreated sample. Hence, the treated zinc chloride would be very useful to design better nutraceutical/pharmaceutical formulations that might offer better therapeutic response against inflammatory diseases, immunological disorders, aging, stress, cancer, etc.